Eggs were classified as meat by the Church in Medieval Europe. They could not be eaten during Lent, so what could be done with surplus eggs? Well, they were coated in liquid fat or wax and set aside to keep (hopefully) until Easter Sunday. Some were coloured using extracts from a range of roots, wild berries or herbs. 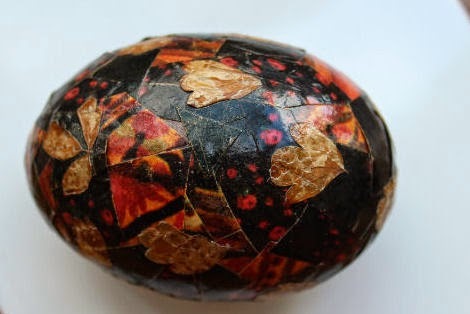 Coloured or not, these were truly Easter eggs! Here are some lovely Burford Brown hen's eggs that I bought recently. Aptly named, some were a stunning chestnut colour. A similar brown to the French Maran's eggs I was lucky enough to spot some weeks earlier in the supermarket. But I cooked and ate these before I thought of taking a picture of them. Around Easter time when I was young my mother, who was very artistic and always ahead of trend, would encourage my younger sister and I to "blow" and decorate eggs. We painted them, or applied a mosaic of coloured paper, small dried flowers, or both. We used home-made flour paste, not shop-bought glue! Once dry, we varnished the eggs. I remember the coloured paper was cut or torn from eye-catching full page advertisements in the colour supplements of the Sunday Times or The Observer. Thanks to my father, our house was full of "heavyweight" newspapers, and mathematics books. But not "ordinary" magazines unless you count Radio Luxembourg's Fab 208 teenage magazine, on standing order at the newsagent for my sister and me. I don't recall my egg results at all - but my mother's were exceptional. Time consuming artistry, because she did have four daughters and several neighbours to make Easter gifts for! To the left is an egg she created for me more than 40 years ago. Unbroken still, the colours are almost as vivid as when it was made. Thanks, I suppose, to that coat of varnish.